Ellie the Elephant is packing her trunk, she’s running away from the circus! So you want your amigurumi to look “really real”? I here you. Check out these patterns and create realistic elephants! These knitted elephants have exaggerated proportions to help them balance, but are fairly realistic – and I love how the artist has included a woolly mammoth variation! This is a paid pattern, but as well as the woolly mammoth, the patten includes three size variations. Look at this lovely trunk! I love it’s gentle ‘s’ curve – just what you think of when you think of an elephant. The designer has not resorted to using wire or pipecleaners or so on to shape the trunk – it’s all done through clever use of crochet. Look at these little guys! I love their sweet little tusks, and the way their ears are lined with pretty floral fabric. Although this is a very abstract pattern, it successfully demonstrates the sheer bulk of an elephant. 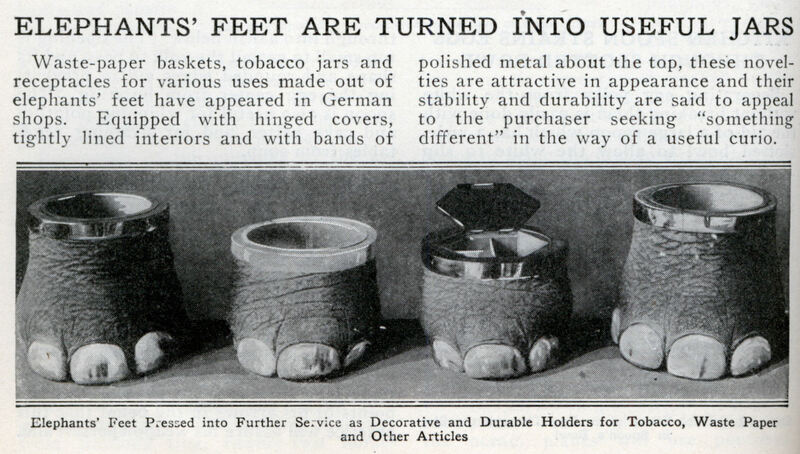 Did you know that they used to make waste-paper baskets out of elephants’ feet? Disgusting, right? Who could chop off such adorable footsies, like the ones on these crocheted elephants? What do you notice first about an elephant? Her enormous nose, of course! This knitting pattern takes advantage of that fact, with a tremendously long – for its size! – trunk. Look at this charming crocheted elephant, with her curving trunk! It’s a face everyone will love. Sweet little Judy the Elephant has lovely big ears! I love the detail of the flower she’s munching on too. Is it just me, or does this elephant have a shy, almost bashful look? There’s something about the tilt of her head which suggests she wants a hug! Elephants wearing clothes get their own category because there are so many patterns for them! I blame Babar – he was always a bad influence. This cutie is wearing an adorable a-line dress – and knitted-in knickers to preserve her modesty! This gentleman has been eating so many peanuts, he’s almost turned into one! I like his stripy bathing suit. This elephant looks as though he’s about to step into the ringmaster’s shoes! Another circus theme! This little crocheted girl elephant is balancing a ball on the tip of her trunk. I love this free crochet pattern and the adorable sailor elephants! I think I would set the hats at a jaunty angle – wouldn’t you? Huh? When is an elephant not an elephant? These knitting and crochet patterns push the boundaries of what can be called an elephant for some truly surprising results! Cover a cheap plastic rattle in cotton yarn to create a cute rattle! Make sure it’s washable, especially if you’re giving this as a gift. Tea cozies may seem silly or old fashioned, but they really work, keeping your tea piping hot! I love this knitted elephant tea cozy, which turns the spout of a tea pot into an elephant’s trunk! This sweetly abstract elephant pillow is reversible! Make two different sides to match your décor, or your mood (I bet you never thought you’d read ‘match your elephant pillow to your mood’ in your entire life! Isn’t the internet delightful?). At the risk of telling you you ought to crochet an entire elephant bedroom suite*, I present this elephant blanket. Designed for little ones, this crocheted blanket will warm and comfort. *Actually, that sounds great! Do it. All images remain property of the artists. Follow links for picture credits. We know some of you love to knit too and who could resist Snowflake the Bunny in our latest issue of Let’s Get Crafting on page 8?